You have to agree that when shooting from a weapon, there is nothing more important that hitting the target, it’s the goal of the shot, right? That’s why sights were designed, to help shooters hit the targets. Red dot sights are some of the most common sights used. However, problems also arise with them, and you probably know that if you haven’t lined it up properly, the dot will not be on target, or if there is a certain distance between you and the sight, it can be off target as well. So, how to solve that? 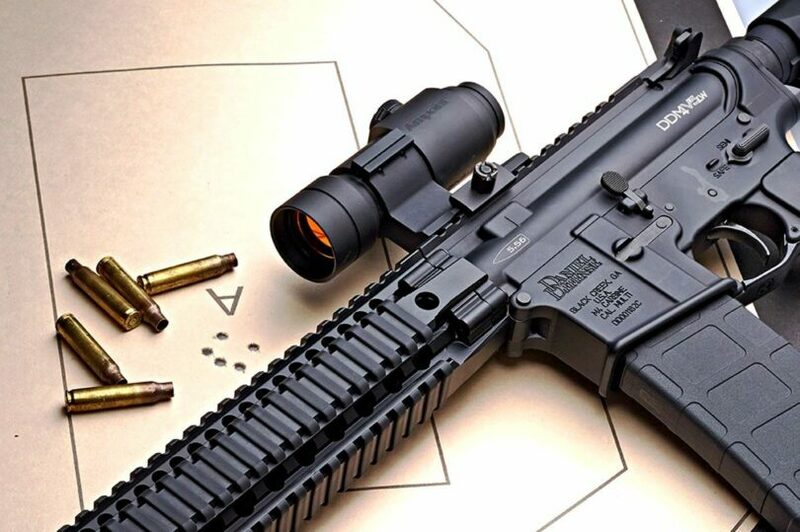 The solution to red dot sights not always being on target if the eyes of the shooter were not properly aligned is a parallax free red dot sight. Basically, it doesn’t matter where you are seeing the dot in the optic from, it is always on target. Move your head to your left and right, and you will notice how the dot moves around in the optic to remain on target. That is achieved through some complex design features, but it’s mostly thanks to the parallax free feature. We came up with a list of the best parallax free red dot sights, so that when you go looking to buy one, you will know which models to look for, which one might suit you better and especially what features to look for in each of them to determine the best one. We will first take a look at the features to consider before buying, and then jump into the different descriptions of each individual model. Hopefully, by the end of this read, you will have enough information to buy the one you need. 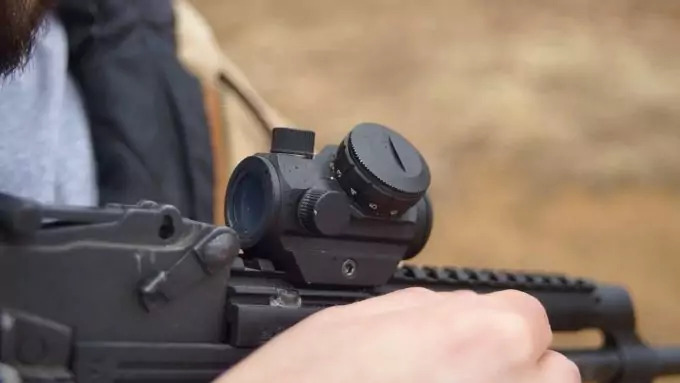 Before you decide which parallax free red dot sight is the best for you, it is a good idea for you to understand which features distinguish them in the beginning. Most features will be present in every model, but keep in mind they vary a little bit from sight to sight, and you want to be informed properly. Below you will find a list with the most important features to consider before buying. 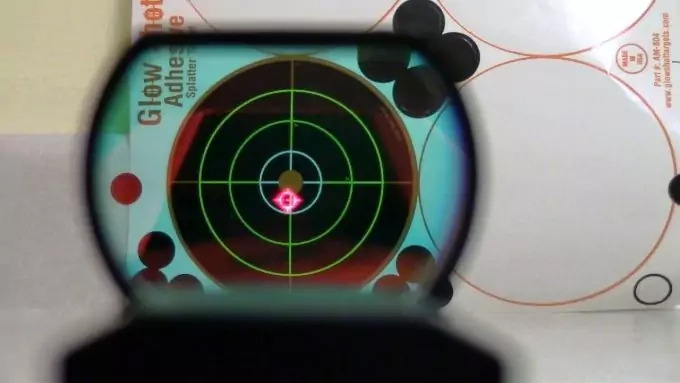 Let’s start from the core of the subject; all red dot sights have a projections, which can be either a reflex projection or a holographic projection. A holographic projection consists of the sight getting illuminated from the front of the lens, where then a laser light projects onto the viewing window which creates a red dot. When it comes to the reflex sight it is a bit different. This projection model reflects an LED light, which is behind the lens, into the line of shooting. The reflex sights are more common than the holographic ones, and they consume less battery life. The mounting is an important feature, although one that is very straightforward. This depends on the rail of your weapon, but most of the time it will be either a Picatinny or a Weaver rail. Also, most parallax free red dot sights are made to fit any of the two or both. However, if you don’t have any of the two, it’s not a problem, you just need to buy a specialized mount with your red dot sight, to adapt it to your rail. It is the same case if the sight you are looking at only works for Picatinny or a Weaver rail, simply buy a mount to adapt it. Weight is a considerable feature for the weapon you use, and the same applies for the sight. It is totally a subjective decision, but you will want to watch the weight, especially if you prefer lighter weights. After shooting many rounds it will be quite normal to feel tired. That’s why you don’t want to add too much extra weight to your weapon with a heavy red dot sight. Also, if you have a smaller weapon, you wouldn’t want the heaviest red dot sight, adding extra weight that will even change the way you shoot. The reticle is pretty much the red or green dot that you see. Now, some sights have more than one reticle option, and this means that they will have more than one pattern. For example, you will have the option of seeing a dot, or seeing a bulls eye. One or more reticles don’t really affect the quality of the sight; they just mean that they give you more options. If you are fine with a dot, then one reticle is enough. If you like another pattern or more options, then more than one reticle is what you are looking for. The MOA (Minutes Of Angle) is a measurement of the spread of 1 inch per 100 yards. That means that through the MOA you can measure the accuracy or precision of your red dot sight per 100 yards. The more MOAs, it means it will be easier for you to measure the precision of your dot, without having to make complicated measurements on your own. 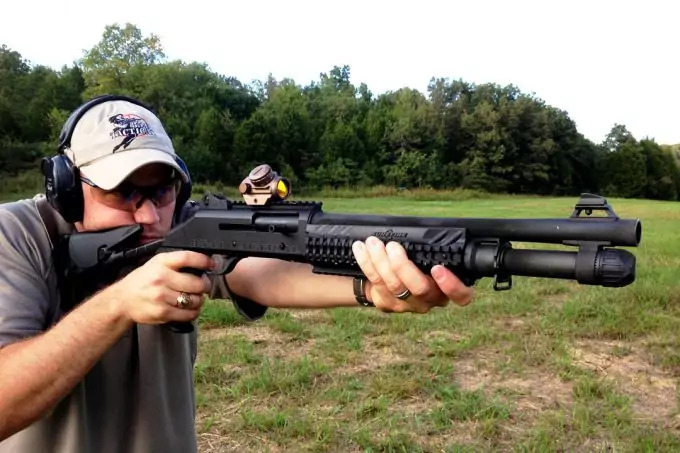 More MOAs also mean that the sight might be more accurate for longer distances, but if you are not thinking of shooting at long distances, one MOA is good enough. After looking at the more important features, it is time to look at the list of the best parallax free red dot sights. The following list consists of eight different models, all of which are good enough for anyone interested. However, they are all different and one might be more suited to you depending on your needs. Take a close look at each description, the pros and cons, and then make a decision based on what seems better for you. 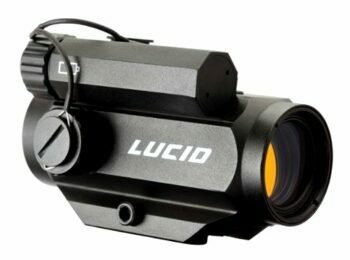 The Lucid Microdot Red Dot Sight comes with a strong but lightweight frame made of aluminum. 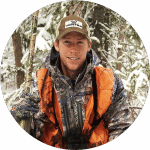 This is one of the reasons why the sight is only 5.4 ounces, but is one of the most resistant and durable ones out there. It is both waterproof and fog proof too, and can be easily mounted into Picatinny and Weaver rails, being ideal for pretty much any weapon. It has two reticles, which provide more options for users, as well as having seven brightness levels. This way you can see it either on darker scenarios, as well as under bright lights and be certain that the dot will be visible at any time. One of the downsides is the battery life, being of only 1,000 hours. Not just that, but the field tests have shown that it runs out fairly quickly, becoming a bit of a problem as you have to change it quite often, especially if you are a regular. Related: The Decibullz Earplugs with a Lanyard are always handy to have. Whether you are going to shoot at the range or outdoors, they will protect you ears from the noise. This Holosun HSG403G Red Dot Sight is by far the one with the most battery life out of them all. The 50,000 hours of battery life are something really hard to compete with. Take into account that this number may vary depending on the use, and it’s not always as accurate, but it definitely has more battery life than other sights. It also comes with an 8 hour auto shut off feature to save the battery life after too much of continuous use. It has nine brightness settings, from which one, two and three are for night vision, whilst from four to nine they are for day time vision. All these brightness settings are excellent, and will guarantee you that the dot will remain visible no matter where you are or what light there is. Another really good and handy feature is how small and lightweight this sight is. It won’t be noticed in the weight of the rifle, and to mount it is really easy, again not taking much space. This is one of the best features by our books. Related: The Magpul Backup Sights are commonly bought alongside red dot sights. What this back up sights does is provide a sight in case the red dot sight stops working or the battery dies. The Vortex Optics Strikeforce 2 Red Dot Sight is one of the best parallax free red dot sights when it comes to shock and recoil resistance. Many reviewers continuously complain about how sights don’t stay zeroed or get loose after shooting a few rounds. This is not the case of this red dot sight. This sight stays zeroed and in place even after many rounds. It has both red and green dots for your preference, as well as a useful night vision mode. The dots have different intensity levels so they can be adjusted to different scenarios or situations. When it comes to the battery life, is a pretty good one, with 6,000 hours. One of the few downsides of this sight is that it doesn’t have that much of a wide field of view, which for some might be an issue. Also, it includes no magnification, so if you want magnification, you’ll have to buy it on the side. 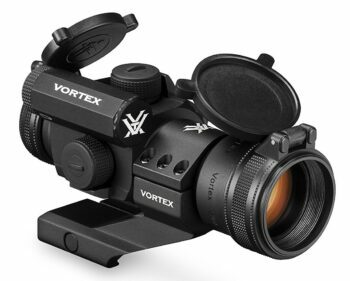 Related: The Vortex Flip Cap Optics will make sure the sight is protected whilst it is transported or not in use, as well as keeping it away from dust, soil or sand. 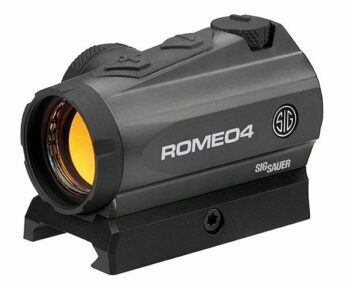 As you can see, the most expensive model on this list is the Sig Sauer Romeo 4B Red Dot Sight, and the reason for this is that it is one of the best. Nonetheless, it is recommended for more expert or advanced users, since the price and many of the additional features it comes with, will be irrelevant for beginners. It comes with the typical dual reticle option, and it includes 2 MOA red dot options too. It has unlimited eye relief, which paired to the parallax free feature, will allow you to always keep the target locked with both eyes open and from any direction of view. 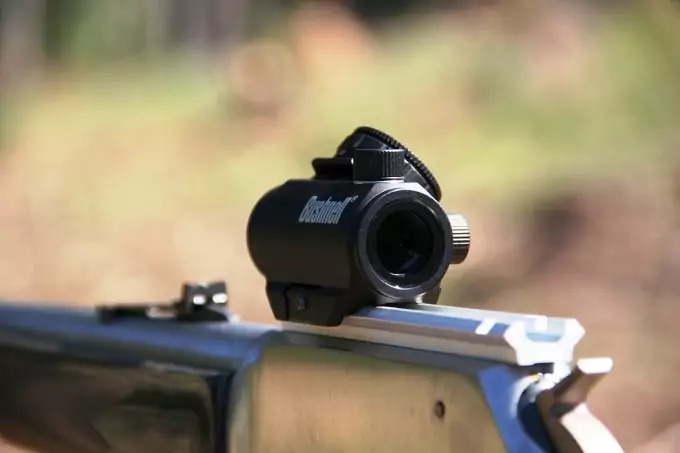 The MOTAC (Motion Activated Illumination System) is what differentiates this sight from the rest. It is a feature that powers up when it senses motion and powers down when it does not. What this does is provide not only safety, but also an enhanced battery life. This is much better than an auto shut-off feature; it is top of the line. 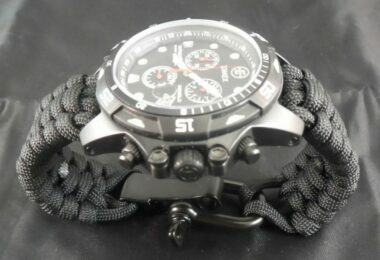 Finally, it is durable, strong and very resistant, but fairly lightweight for the quality that it offers. Related: The Sig Sauer Magazine Loader is commonly bought with this sight. It is from the same brand and it will fit any Sig Sauer gun. 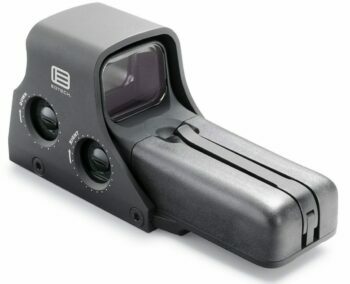 The EOTech 512.A65 Red Dot Sight is one of the few holographic red dot sights on this list. This means it uses a laser to illuminate the lens and project the red dot. It is designed specifically for closed combat, where it is faster to lock the target, meaning you will shoot much faster than with other sights. 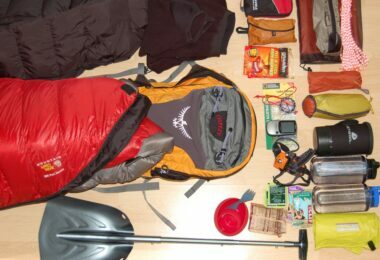 The materials with which it is constructed are very good and strong, which is why it is slightly heavier than most of the other models on this list. It is waterproof, fog proof and strong against shocks and recoil, ideal to last long after many rounds shot. It has 1x magnifications, more than enough for close combat. It also comes with unlimited eye relief, which added to the parallax free feature, makes it ideal to shoot accurately with both eyes open all the time. The only downside is the battery life, which is only about 1,000 hours. However, this is due to it being a holographic sight. Related: The Supercoat Cover for EOTech is the ideal companion of this sight. Cover it up when not in use or for storage and keep it away from dust or bumps. 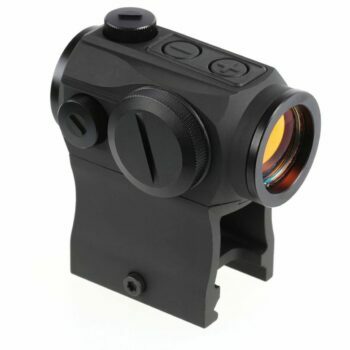 The Holosun Micro Red Dot Sight is a similar model to the other Holosuns in this list, but a bit more compact in size and with a smaller dot. This doesn’t mean it is better or worse, simply different. 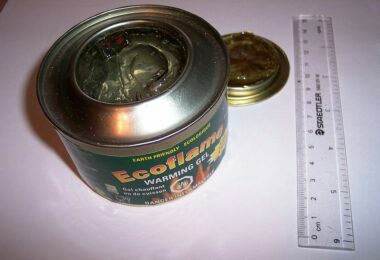 This particular model has a great coating for the lens, and it is very strong and resist and against shock and recoil. As a matter of fact, the smaller and more compact size makes it stay in position, zeroed, and steady better than most of the other models. It has a 5,000 hours battery life, which is good for red dot sights. 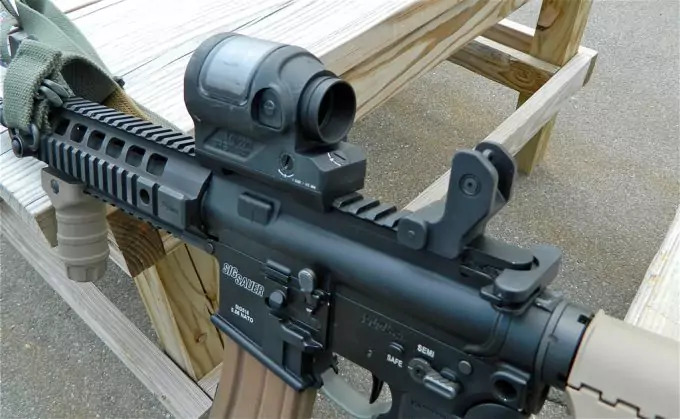 The best feature is the micro red dot sight, which is an ACSS sight. 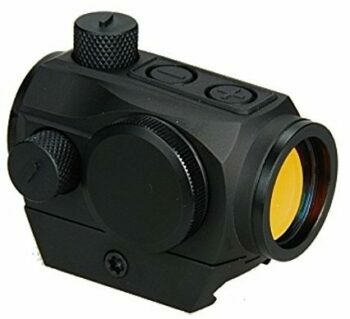 Experts consider this ACSS BDC reticle as the best red dot sight available in the market. It is the most reliable and steady one. The only difference is that it is smaller, so people that suffer from bad eyesight or from astigmatism, will need some time to get used to is, or will have to buy a magnifier. As a matter of fact, we suggest getting a 3x magnifier alongside the sight. Related: The Primary Arms 3x Magnifier is exactly what you need with this red dot sight to make sure the dot will always be visible. 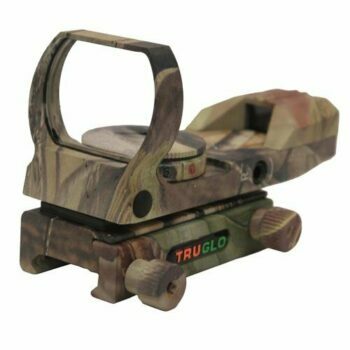 The Truglo APG Red Dot Sight is a sight with an interesting design, as it has a military color, for those who fancy such designs. 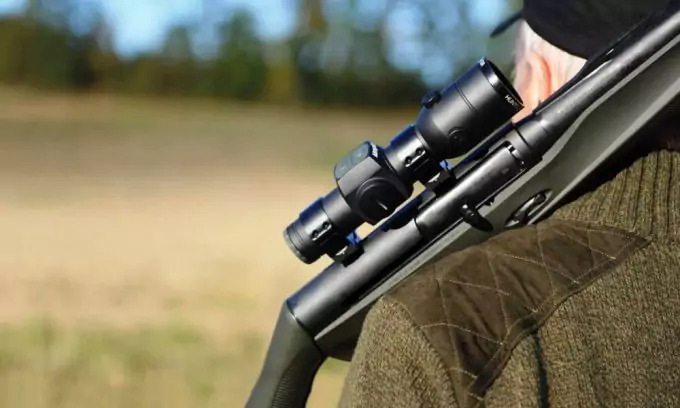 When it comes to the item itself, it has a parallax free feature from 30 yards as well as an unlimited eye-relief, ideal to use the sight with both eyes open. It has a very wide field of view from 24 mm to 34 mm, which means you can locate the target quickly and from a wider field than most of the other sights in the list. It also comes in two colors, red and green for you to decide which one you prefer. It comes with an integrated Weaver rail mount, so in case you have a Picatinny or any other rail, you might need to buy another mount to adjust this sight into your weapon. It is a pretty resistant sight, waterproof and shock resistant too. It has a very easy to use click system to adjust the windage and elevation, so no need to use an Allen screw, just a click. 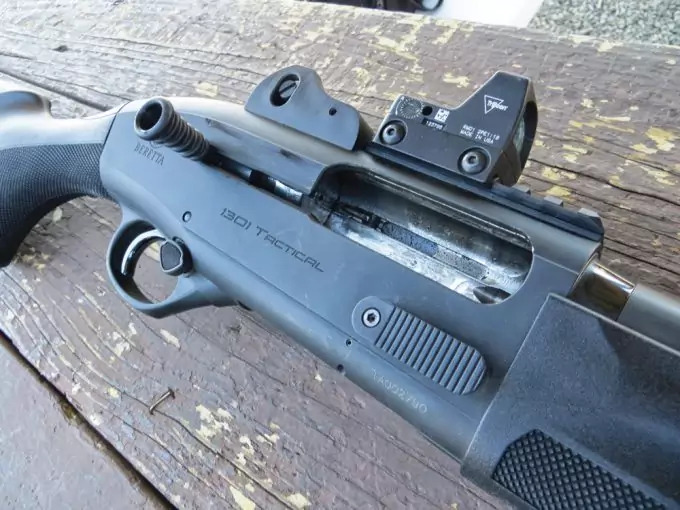 Related: The UTG Mossberg is a mount that can be bought with this sight, that way you can mount the sight in different weapons, in particular a shotgun. Specific features: 4 MOA red dot, waterproof and shockproof, extremely lightweight. 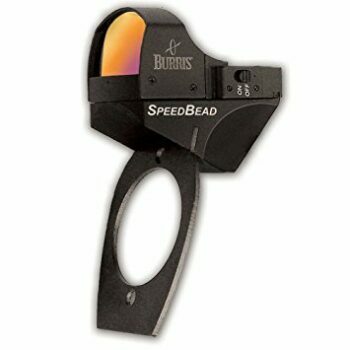 The Burris Speed Bead Red Dot Sight is by far the lightest of red dot sights in the list. This particular feature makes it a favorite amongst many reviewers, because by being so light it adapts to many different weapons easily, without interfering with the feel of the gun whilst shooting. Also, by being so lightweight, it increases the speed with which you can take the shot. It is very resistant, despite being so light. It is both waterproof and shock proof, and it can take a beating of many rounds shot without going out of position. It stays zeroed pretty well. It also comes with a 4 MOA red dot, which is very easy to spot and very bright. The only problem with this sight is that it is designed on purpose for speed shooters and smaller guns. It doesn’t have many reticle options or features for long-range shooting or bigger guns. Related: The Howard Leight Earphones are great to have when you are shooting any weapon, either at the range or anywhere else. They will make sure your ears are protected from the loud noises coming from shooting. Time to wrap the article up. 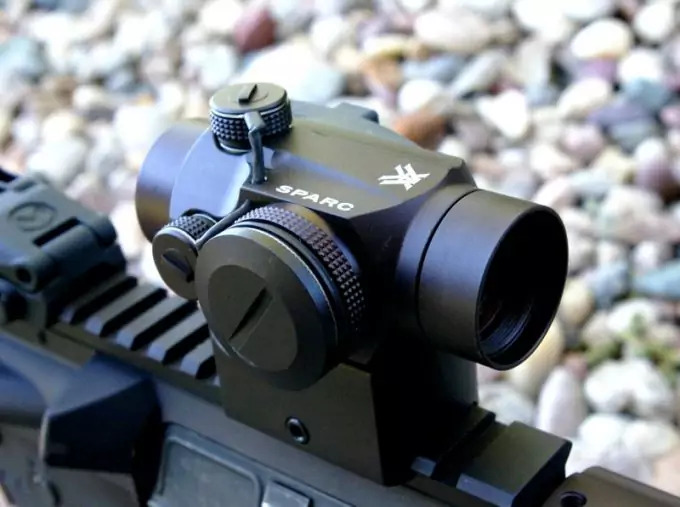 It is important to remember how parallax free red dot sights differentiate from common sights, as they give you the option to keep your target engaged no matter from which angle you look through the optic. Instead, normal sights will be much harder to handle. Also, features such as the reticle options, brightness settings, and MOAs can influence the way you shoot depending on where you are or the distance to the target. Therefore, depending on what you plan to use the sight for, remember to consider these features. Do you think we missed any model of parallax free red dot sight that you have looked at? Do you have any other questions? Please add your opinions, doubts, or anything you want to say in the comment section below, we’d like to hear from you!